Mel, why on earth would a grown woman want to buy a cheap knock off bag? Firstly, PVC looks tacky tacky tacky. Secondly, think of the 5 year old kids in China working 18 hour days to stitch the piece of garbage together -- likely since it costs $40. 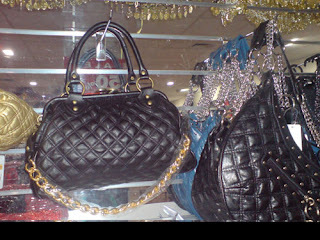 Thirdly, A cheap PVC handbag is not fashion, nor style. It is garbage. At first I felt Michelle had completely missed my point, because, for me, one of the most interesting parts of the Stam exercise was to see how a style alters as it filters down from couture to bargain basement: how it changes shape and size, its details and colours change, and most interestingly, how its much more diverse distribution helps it make the shift from an exclusive status item to an everyday handbag. Michelle's comment instead chooses to outline several distinctions or hierarchies. To put it simply, she is making a space for herself within the fashion system that she feels I ("a grown woman") ought also to occupy. But I have disappointed her by occupying another kind of space, in which buying a cheap PVC knockoff designer bag is really exciting and cool and makes me happy. I think it's fascinating the way the comment is so emphatically affective in its expression. I'll get back to that. But I do find these hierarchies interesting and instructive, and I want to unpick them. Some are so much discussed in fashion literature that they seem self-evident; but I think it's worthwhile articulating them anyway. First, Michelle is creating a hierarchy of material quality, suggesting that leather is a 'better' material to make handbags out of than PVC. You could similarly argue that nylon is an inferior substitute for silk, or polyester an inferior substitute for cotton. But the thing is that the way we value fabrics is constantly shifting. Historically, anything that was expensive because it was difficult to obtain or painstaking to make was a status symbol. More recently, synthetics were embraced as a welcome innovation because they improved on the properties of natural materials. Metal and then plastic made for more comfortable corsetry than whalebone. Rayon drip-dried where silk needed to be hand-washed. And since the 1960s, couturiers have enthusiastically incorporated synthetics into their collections, from Courreges and Cardin to Donna Karan and Prada, not only because it signified 'forward-lookingness' but because they were keen to experiment with new technical possibilities. Concurrently, ideologies of 'purity' and 'quality' developed around natural materials - they 'breathe' better; they last longer; they're better for the environment. But the most important thing is that synthetics are cheaper to produce and buy than natural materials, so natural materials have retained associations of luxury and status. I am not interested in status, which is why I'm not buying an actual Marc Jacobs bag. But I am interested in the feeling of luxury that the bag gives me. A large part of this feeling is marketing; but luxury is also a look and a texture (I've linked it with the sparkliness of diamonds and the softness of fur), and for me - and, I'd argue, for the millions of other people who content themselves with imitation luxury goods - if a synthetic material can mimic that look and texture, it's good enough. Second, Michelle is presenting buying 'ethically' (ie, avoiding products likely to have been made in sweatshops by innocent, exploited kiddies) as a kind of moral privilege - something that places the discriminating ethical buyer further up the hierarchy than the non-discriminating knockoff buyer. But ethics really are a slippery slope - what about avoiding the systematic cruelty to animals that comes with poached and farmed fur and leathergoods, or the weird "see my vest, see my vest" fetishism of making fashion accessories from ostriches, crocodiles, snakes, et cetera? I'm not defending sweatshops. They're indefensible. But here, moral privilege is linked to economic privilege - that spending more money is a more moral option. And that just doesn't hold up. Any handbag is likely to be made in a sweatshop - indeed, many designers outsource their manufacturing to China, where their bags are made in the same factories as their knockoffs, to the same patterns and specifications. If I wanted a more ethical handbag, I'd seek out a local designer who handmade their bags locally. But again, that's not what interested me. I was interested precisely in cheapness, in a logic of seeing how cheaply I could buy this supposedly cult product. Here we get to the crux of the matter. Michelle is creating a hierarchy of authenticity. She's suggesting that only the 'real' designer item qualifies as 'style' or 'fashion', and that anything else is worthless 'garbage'. I couldn't disagree more. Of course, intellectual property in fashion design is a sticky area, but I don't think that's what Michelle is really getting at. Instead, she's arguing that there's an emotional response that a 'real' designer object gives you that a knockoff never can. This is the logic that has people buying cheap things at Tiffany so they can get the famous blue box, or buying designer perfumes to 'dress' themselves in fragrance. I'd argue that when you name your bag after a fashion model then it's just ludicrous to claim that the item has no association with style or fashion. And if it is constantly photographed being used by celebrities who are popularly identified as 'style icons', then it becomes less important as an object than as a signifier of 'fashionability'. Again, I'd argue that it's not important to have the real Marc Jacobs; instead it is important to have a bag that looks like one, in order to show you are plugged into the media system that drives the trickle-down process. Ultimately, you buy something because of the way it makes you feel. Personally, I am seized by a fierce joy when I look at the size of my Stam's gold chain, and the diamond-studded brooch pinned to it that reads "Jesus". I've noted that luxury is not an observable and incontrovertible property of an object, but a feeling instilled by a combination of ideology and, as Bourdieu would argue, habitus (the tastes that your class and upbringing have taught you to desire). Michelle is getting a little up in my habitus when she says that only "tacky" people who cannot appreciate the finer things would buy a bag like mine. In Distinction, Bourdieu argues that the proletariat have only "the taste for the necessary" - because they don't have the cultural capital to foster aesthetic appreciation, they tend 'naturally' towards the utilitarian. But I think this has more than a tinge of those racist stereotypes of indigenous peoples adoring shiny baubles without appreciating their 'real' use. Indeed, another French sociologist, Bernard Lahire, has shown that most people's "taste profiles" are not consonant with their class location. Rather, they're "dissonant" even within individuals - you can like both "tacky" and "sophisticated" things. Whatever. I love Stam. I don't need to justify it to people on the internet. The end. Well. I have viewed the Stam. I like it. But I really do not think it is worth $70. There, I have said it. 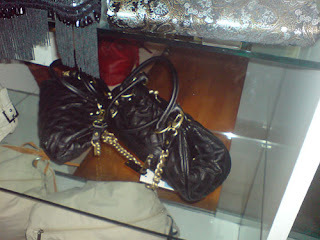 I wanted it to be, but it just seems that you could get even a cheap real leather bag for as much. to be more detailed, and the lining looks different - though it's impossible to tell if it is better or worse. But then it does say of the eBay stam: "There is an attachable chain which is optional, my only complaint is that the chain isn't long enough, however it still looks gorgeous attached on the bag." Don't know if this is the case for the one in AS. But in conclusion, the one on ebay looks more authentic, like a better copy. But it is on eBay, so is more difficult to assess and ultimately purchase. PS. the beige colour was much nicer than I'd imagined! But ultimately I couldn't be bothered seeking out a Stam online, paying for shipping, etc, when I could go down the road and buy one and have it right now on my desk in my peripheral vision, making me happy. As you can see I have already customised it with my Jesus brooch; and I plan to add all manner of other tat. Hoorah! It is ridiculous how elated I am to own a knock-off bag. I don't usually get excited about designer handbags, and I don't follow designer knock-offs that closely, but since early December I've been obsessed with the Marc Jacobs Stam bag, named after model Jessica Stam. It began when I saw two different examples for sale at the Camberwell Market. I thought it was quite a smart style - it takes traditional Chanel-esque quilting and the clasp frame style and makes it look quite contemporary, and I hadn't seen it anywhere in Melbourne yet. And it's quite a large, handy size, although you can get smaller versions, hobo-styled versions, and longer, shallower versions with two zips, called the "east-west Stam". The vendors wanted $50-$60, which I thought was quite expensive for a market bag, until I did some internet research and realised it is one of those cult bags that does a roaring trade on eBay. I reasoned that surely there would be some more affordable knock-off versions of this bag for sale in Melbourne. The good folk at Sassybella advise not to buy any of the "designer inspired" versions as PVC is "a tacky look". That's a shame, because what interests me most about this bag is the subtle variation in styling in various knock-offs I've come across in Melbourne. You see, I discovered that there really aren't that many knock-off Stams in shops here. 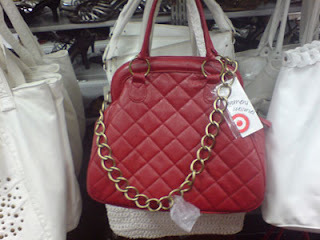 There really aren't even that many quilted bags with chain handles. I was surprised, because a couple of years ago there were many, many bags that ripped off the key motifs of Balenciaga's motorcycle bag (the diagonal buckles, the stitched handles, the long fronds). This is the first fake Stam I saw, in Target of all places. I like the red, but you can see immediately that they have got the shape wrong, and rather than a clasp, it has a zip across the top. But on the upside, it was $40. Of course, when I went back several weeks later, they were all gone. Aaaah, that's more like it! This was in an el-cheapo CBD shop called Femme Connection. Can you see that it even has the flat-top clasp? It was also $40 and I would totally have bought it, despite its brassy-looking chain, except that the zip on the outer pocket was broken and they didn't have another bag. Also, it was Christmas Eve and I was in a panic and couldn't be bothered talking to the staff about it. This one I spotted in the window of a bag shop in Howey Place. You can see that the clasp isn't right, although the chain is the right colour. The shop was closed, so I don't know how much it costs. Of course, I could just buy a knock-off from eBay, where they are actually made of leather and come in a rainbow of colours. But the thing I have really enjoyed about this search is the random surprise of finding another variation in a shop, rather than a sterile kind of "I want, I got" mentality. For me, that's half the pleasure of shopping - actually seeing what's out there. Omg lucy, stam!! I saw one in apple spice for $70 and it's the right size and with the right chain and clasp and they have it in red and beige too! OMG indeed! You must get one! I want one! Although 70 is a bit steep...and i wouldn't want red or beige. Red is perfect for you though. I haven't bought the bag, as I think $70 is indeed rather expensive for a knock-off bag. But we'll see how long that kind of thriftiness can withstand my bizarre new Stam bag hunger.